On this 16-day overland camping tour you start in South Africa’s famous Kruger National Park before you continue your journey through Zimbabwe and Botswana where you explore the amazing culture and natural beauty of these two countries. 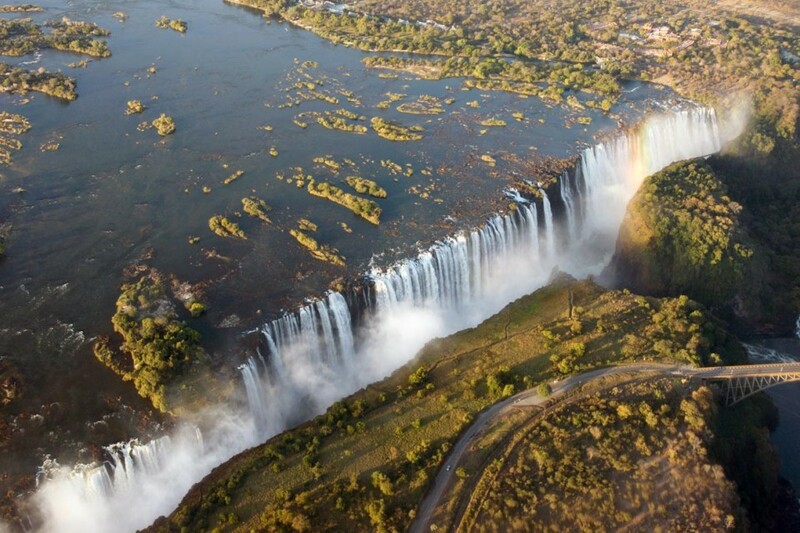 Marvel at the Great Zimbabwe ruins and experience the power of the Victoria Falls. Explore the Okavango Delta by traditional mokoro and go on a boat ride to watch the huge elephant herds in the Chobe National Park. 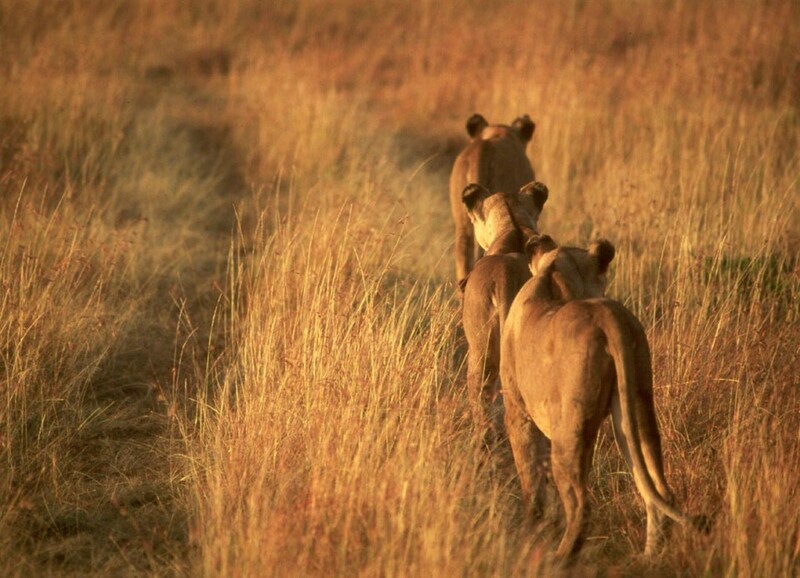 This safari covers it all – wildlife, history and culture. Departing in the wee hours of the morning from Johannesburg you head northeast to the remote north the world-famous Kruger National Park. 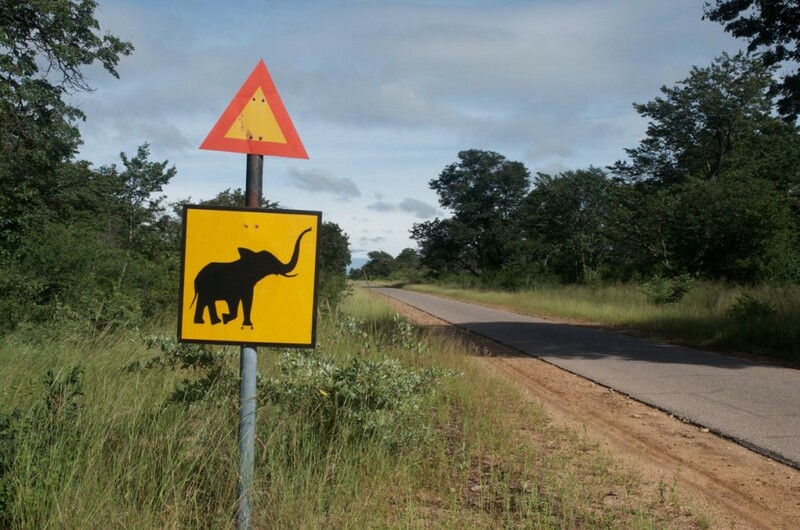 The Pafuri region is famous for elephants and abundant birdlife, with Letaba an area of war between ivory poachers and game rangers. Pafuri is a paradise for birders. You join morning and afternoon games drives in our safari vehicle and hope to spot elephant, leopard, bushbuck and vervet monkeys in this isolated part of the reserve. Entering Zimbabwe at the Beitbridge border post, you travel to the town of Masvingo and the Great Zimbabwe ruins. The ruins are some of the oldest and largest stone structures in Southern Africa and its history and origin is still a topic of debate among archaeologists. It was built during the 11th century by an unknown civilisation. There will be time to explore these ruins on foot. Driving to Bulawayo and the Matobo National Park, you visit the Matopos Hills (declared a UNESCO World Heritage Site in 2003), an area of bald granite hills and forested valleys. Camp will be set up on the outskirts of the park. 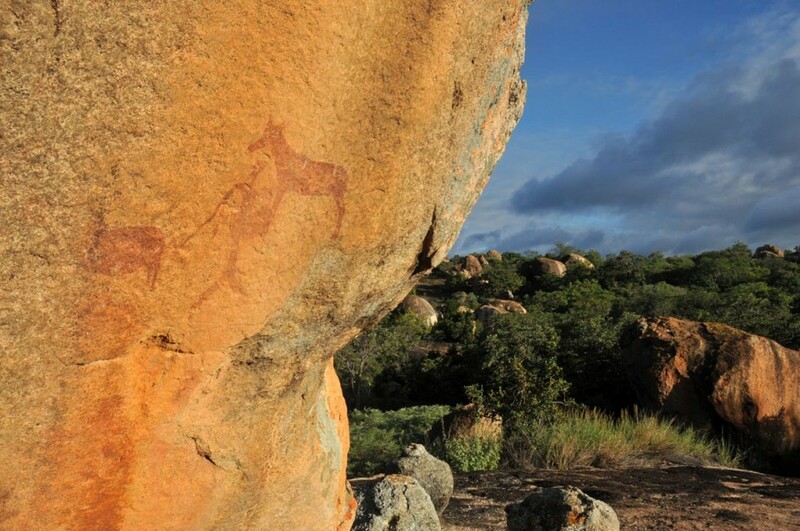 In the afternoon you explore the area’s hills and caves on foot to see Bushmen paintings and rock formations. The next morning you visit World's View and colonialist Cecil John Rhodes' grave. Later you go on a bush walk to track rhino, but you might also see sable antelope and impala. 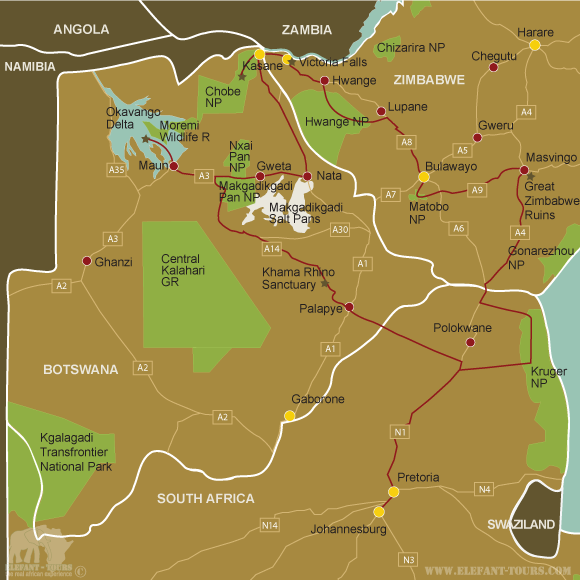 Today you will travel to the north-west to Hwange National Park the largest park in Zimbabwe. It is home to over 100 mammal species (including African wild dogs and brown hyena), a large elephant population and about 400 bird species. The day will be spent on a game drive with a local guide in an open 4x4 vehicle. You spend two nights in the town of Victoria Falls. Walk to the edge of the ‘smoke that thunders’ - Victoria Falls. The energy of the mass of water might energise you to choose some exciting optional activities ranging from white water rafting (most popular) to walking with lions, elephant interactions, bungee jumping and scenic flights over the falls. These excursions are not included in the rate. Today you arrive in Botswana, one of the most stable countries in Africa with the highest per capita growth rate in the world. The camp in Kasane is on the banks of the Chobe River that forms the northern border of the Chobe National Park. The reserve’s vegetation is influenced by water; vegetation types here range from swamps to woodlands. You may see anything from elephant, hippo, crocodiles and impala to the rare wild dog and sitatunga. This afternoon you will join a game viewing boat cruise for sundowners while watching hordes of elephants and other wildlife as they come for their own sundowners at the river. Sleep in or go for an early morning game drive (optional) in the Chobe National Park. Returning from the park, you drive south through the Kasane Forest Reserve to the Nata area for your overnight stay. 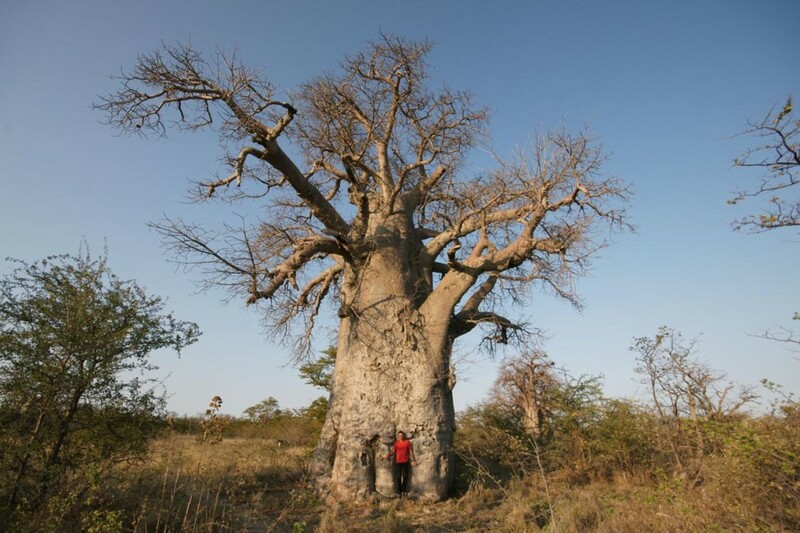 Today you travel from Nata in the saltpans to Maun, the gateway to the Okavango Delta. Maun originated as a cattle outpost and is now the ‘capital’ of Botswana’s tourist industry and therefore the base for excursions into the delta. The camp is situated on the banks of the Thamalakane River and after settling in you can relax with a something cool at the pool. You drive into the delta in open 4x4 vehicles. Local guides will take you deep into the heart of the Okavango Delta on mekoro (traditional wooden canoes). Being gently ‘poled’ through the network of crystal clear waterways and lily-covered ponds is a sensory experience not to be missed. The delta forms when masses of water from the Angolan highlands spreads out over the Kalahari desert plains, creating a brief oasis for birds and wildlife. You will camp on remote islands and go walking, bird watching, swimming in the clear water and learn more about the lifestyle and culture of the local guides. You return to Maun in the late afternoon of day 14. There might be time have time for a flight over the delta (optional activity, not included in the rate) for a bird’s view of the silvery spiderweb of water. From Maun you will continue south, crossing the Kalahari on your way to the Khama Rhino Sanctuary near Serowe. The Khama Rhino Sanctuary Trust is a community-based project established over 20 years ago to save the white rhino. This reserve situated in the Kalahari sandveld, has several natural waterholes and provides prime habitat for white rhino, zebra and wildebeest, but the dense vegetation in the south is preferred by giraffe. You will hopefully be able to spot one of these elusive horned creatures on an afternoon game drive. Today you drive back to South Africa to reach Johannesburg in the late afternoon. 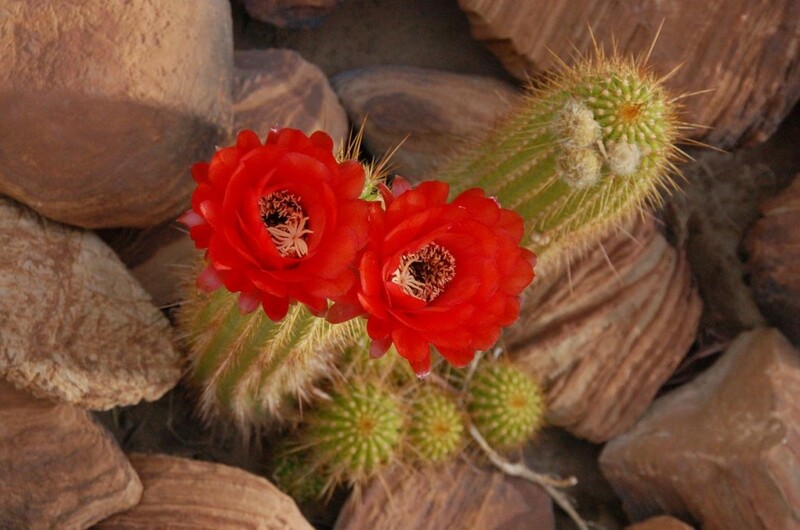 Extend your stay for a few days or book an onward journey to see more of South Africa. - 13 nights are spent in spacious 2-man dome tents (2,2 x 2,2m) on campsites with good ablution and other facilities. - For the longer distances we make use of safari trucks that have been reconstructed in order to cope with the demanding African conditions. Big windows guarantee first-class game and nature viewing and a spacious interior with comfortable seats offer a high travel comfort. The back part of the vehicle is used for luggage, food and camping equipment. - On game drives in Hwange National Park we make use of an open 4x4 game drive vehicle with trailer. - In general European citizens do not require a visa for South Africa and Botswana. For Zimbabwe a visa is usually required. - As the Kruger Park, Zimbabwe and Botswana are situated within a malaria area, we would recommend some precautions. Please speak to your doctor or travel clinic about the different prophylaxis and their effects and side effects.